Greetings. I hope that now that spring is (mostly) here you and your families are enjoying the change of seasons. 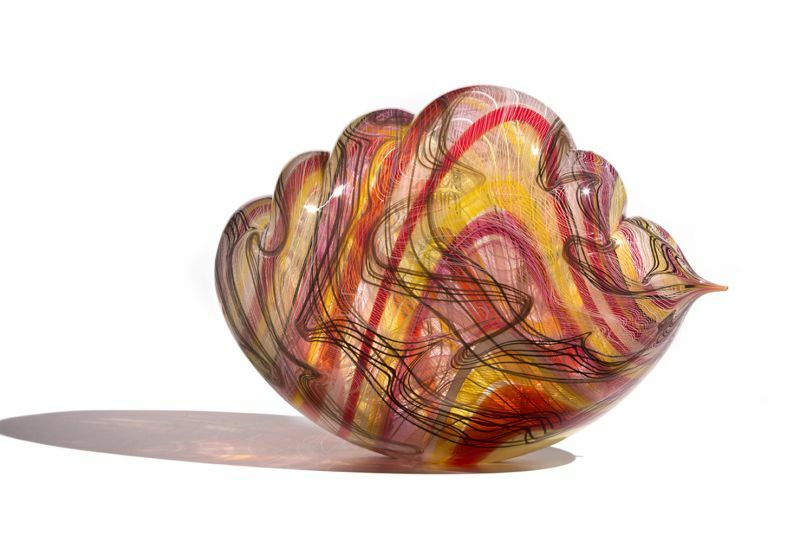 This month I have chosen some wonderful works by several outstanding glass artists to share with you. I hope that you enjoy them and look forward to hearing from you. 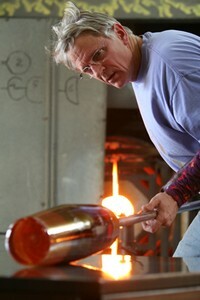 I am very sad that we recently lost one of our most beloved glass artists, Stephen Rolfe Powell. Stephen was not only a great glass artist but a great human being. He always had a kind word, a humorous comment and a wonderful smile for everyone he came in contact with. His past and present students at Centre College in Danville Kentucky will miss him sorely. As will everyone in the glass community who had the pleasure of knowing him. Our condolences go out to his wife Shelly and their two sons. I chose this beautiful piece while visiting with Lino and Lina in Seattle in early February. It is probably untitled due to the fact that it looks a bit like several other of the maestro’s series but not enough to fit neatly into any one of them. 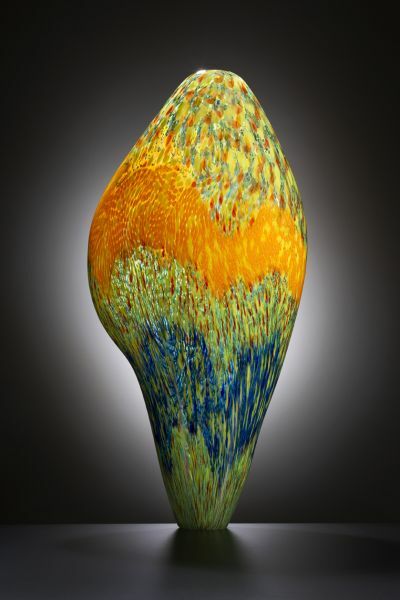 I love the free from and the wonderful colors in this painterly glass sculpture. Reverence by Jon Kuhn, 9.5" high x 6.5" x 6.5"
This colorful new cube by North Carolina artist Jon Kuhn was just finished in the last week. It is unusual in that it is quite a bit smaller than most of Jon’s other works. The optics are amazing! Nancy’s Cloud series is one of my favorites and this is one of the most vibrant and beautiful works I have seen from this series. I love the palette of colors here and the swirly pattern of the canes. The form is flowing, organic and enticing. This new piece by Laura Murdoch transcends its simple vessel form in so many ways. Murdoch uses large ancient simple forms as blank canvases on which to "paint" her patterns on the glass, through sand-carving and other processes, building them one layer at a time through the "graal" process. She then reconstructs these patterned pieces into an exuberant, cohesive whole far greater than the sum of its parts. 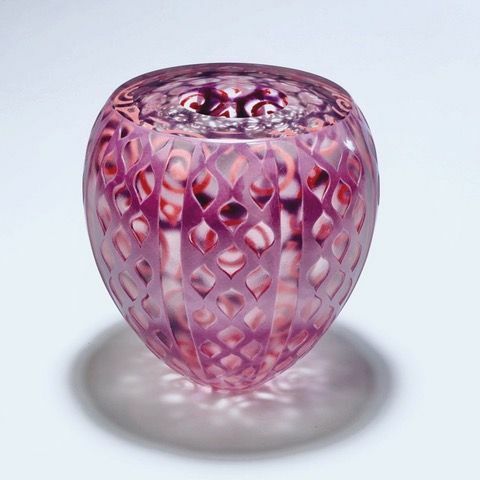 What an elegant piece by Seattle glass artist Dante Marioni. The bright red stripe stands in dramatic contrast to the intricate black on clear cane work. 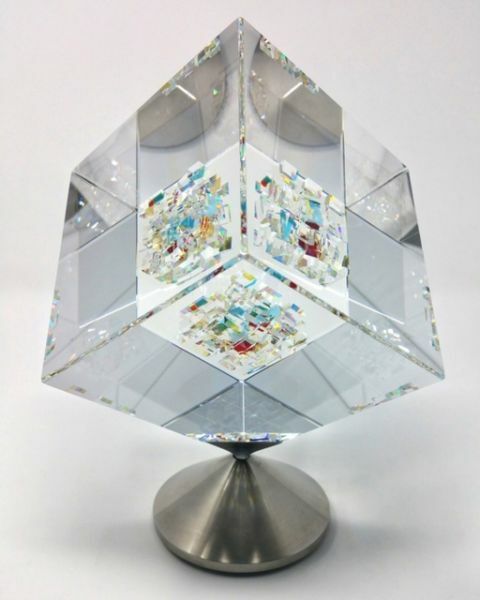 The vertical form of this piece offers an uplifting feeling to the beholder. I hope you have enjoyed this month’s issue of Holsten Galleries News. Be well and stay in touch.